oe Smith, one of the most powerful men in American music, is in the news again, this time for his donation to the Library of Congress of conversations he recorded with some 200 of the most important musicians and record industry figures of the 20th Century, including Paul McCartney, Bob Dylan, David Bowie, George Harrison, Little Richard, Barbra Streisand, Paul Simon, Ahmet Ertegun, Jerry Lee Lewis, Tony Bennett, B.B. King, Quincy Jones, Ray Charles, Bo Diddley, Les Paul and Ella Fitzgerald. 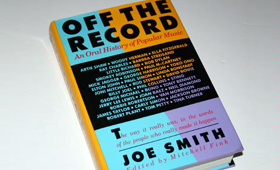 Smith recorded the talks for his 1988 book, Off The Record. The 238 hours of recordings will be accessible in the Library’s Capitol Hill reading room, and some are slated for streaming later this year on its website. 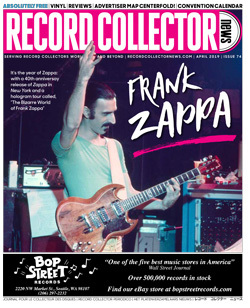 By contrast, I was in my early 20s, just a year or so into my job as editor of the music trade journal Record World, a position I attained by default after, in little more than a year, everyone above me on the masthead quit or was fired. My internal butterflies grew in wingspan and airspeed after my boss explained that a summons from a record company titan means either that he’s pissed that one of his records has lost its bullet on the charts, or, best-case, he wants some glowing editorial coverage. To my great relief, Joe wasn’t mad or demanding. Instead, he was curious about my plans for the magazine. The truth was that since I hadn’t quite gotten the hang of the job, my strategy began and ended with the desperate hope that each issue would hit the streets with all the pages in the right places. 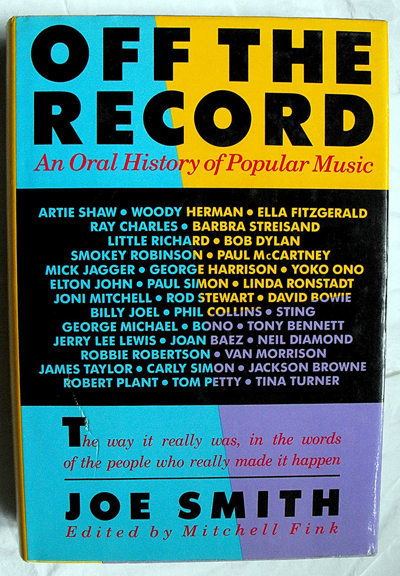 Off The Record (edited by Mitchell Fink, my predecessor at Record World) is a good read, but listening for hours to these relaxed, candid exchanges is a once-in-a-lifetime gold mine. Most astonishing is the way these icons express the sheer wonder they felt when they first hit it big. 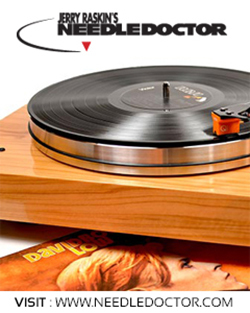 If you think the greatest stars were born with self-confidence, check out Ruth Brown (“How did I get here?”), Ellie Greenwich (writing while riding the elevators of the Brill Building) or Peter Frampton (recording with his rock & roll heroes when he was 14) and Little Richard (“I didn’t even know I had hit until I heard my record (“Tutti Frutti”) on the radio”). In addition to his passion and fine ear for both music and conversation, Smith was the most hilarious MC ever to grace the dais of an otherwise soporific charity dinner. His sharp one-liners knocked his self-important peers down a peg and created the feeling, if only briefly, that the industry was a fractious family tossing affectionate insults around the dinner table as opposed to a ruthless fight to the death.